One of my favorite bands when I was a kid was Led Zeppelin. Here are a few things we can learn from them. Bringing together elements of blues and folk music, Led Zeppelin created a unique sound that popularized a new sub-genre of rock music—heavy metal—and broke records for album and concert ticket sales throughout the 1970s. With a combination of four musicians whose diverse talents were extraordinary, the band explored sounds and styles that had not been heard in rock music before. Led Zeppelin's behavior while on tour became as legendary as their performances. The group's recordings remain commercially popular to this day, and both newly uncovered recordings and films of their performances have been released to great success. 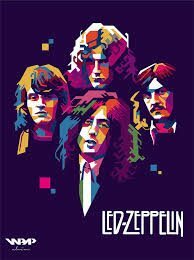 It is difficult, if not impossible, to imagine classic rock radio without them, and there cannot be many rock fans who have never heard “Stairway to Heaven” dozens of times. When Jimmy Page's popular band, The Yardbirds, broke up, he was left with a string of unfulfilled contractual obligations and no band to fulfill them. But Page knew what he wanted and who he wanted to play with. Did he get everything he initially wanted? Of course not! But the setbacks he experienced led to greater success when he was introduced to Robert Plant and John Bonham. Page's ability to adapt to unexpected circumstances provides a great model for business as no business is guaranteed success. The prospective owner needs to be willing to work to get the growth which will, hopefully, eventually, become a self-supported entity. Led Zeppelin maintained a highly demanding touring schedule for several years. The band maintained that experiencing their music live was preferable to static performances on television, and their fans agreed. Led Zeppelin consistently broke box-office records and even today, fans hope for a chance to see the surviving members of the band perform live. Touring is incredibly hard work, but Led Zeppelin was determined to meet their fans and put in the time necessary to make connections with their audience. the lesson here is that a successful business owner steps out of his or her ivory tower once in a while to reconnect with the public which supports his or her company – even if it is a television commercial or a blog on the internet. Remember those who helped you be successful and they will remember you. Led Zeppelin has a surprisingly consistent recording history. Five of their original albums reached No. 1 on the charts upon release, and nearly every album of original material attained platinum-level sales. There are few missteps in the band's recording career, allowing Led Zeppelin to maintain their monumental popularity. This requires focus, concentration, endurance, and an ability to meet the demands of an audience without becoming creatively stagnant. Led Zeppelin modeled this behavior with highly successful results. It is a good model to follow for any business. Upon the death of drummer John Bonham, Led Zeppelin called it quits less than four months later. Led Zeppelin has also largely resisted demands to embark on an extensive reunion tour using a replacement drummer. Although other bands have continued on with success after the death or absence of original band members, Led Zeppelin chose to keep the integrity of the original group, reasoning that their sound with Bonham was unique and could not be replicated. The surviving members of the band have had successful solo careers, and Led Zeppelin remains one of the most enduring acts in rock music, probably as much of a win-win result as can be expected in the wake of personal tragedy. It is never to be assumed that a business will start, grow and prosper with the same line-up that was there at the beginning. Shutting down upon losing a co-worker or fellow owner is a personal decision, not one that everyone will make – most businesses don’t provide residual income. Unlike the music world well-run companies survive the loss of a member or two or three. Since the demise of the band, Led Zeppelin has maintained a very consistent level of sales by releasing newly discovered recordings and films of the band in performance at key moments. Led Zeppelin has been careful not to flood the market with these releases, so that demand for the band's product remains high. And because the band chose to break up after the death of John Bonham, the music they recorded has lost none of its legendary status. The surviving members of the band are now in the enviable position of maintaining their reputation as part of one of the most influential rock groups of all time, while still continuing with solo projects and timely releases of “new” product. In the “real world” businesses aren’t successful if the owners don’t keep working them; however that doesn’t mean that a well-developed product won’t pour money into a developer’s pocket: Microsoft used to buy well-developed software. Smaller companies are often bought out by wealthier competitors so work well, and prosper.